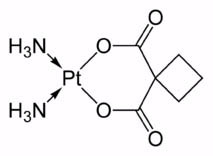 Carboplatin is a platinum organic compound. 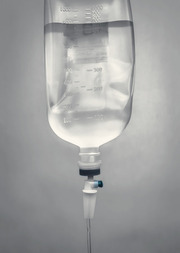 Plain carboplatin appears as white crystals or powder, but it is mixed into a saline solution and administered through an intravenous feed. The feed tube is called a cannula, and patients usually receive the medicine over a 30 to 60 minute time period. It is sold under brand names Paraplatin and Paraplat, among others. The full chemical name is 1,1-cyclobutanedicarboxylatodiamineplatinum(II). Packaged as paraplatin, it comes from the manufacturer as 10 mg/mL solution. (The solubility is only 14 mg/mL, so the clinical product is close to saturated.) Vial sizes are 5 mL, 15 mL, 45 mL, and 60 mL. At the hospital, technicians and doctors sometimes dilute the drug down to 0.5 mg/mL. Sugar (dextrose) and/or salt (sodium chloride) are often added to the solution. Other makers sell carboplatin as a powder, in prepackaged dosages of 50 mg, 150 mg, and 450 mg.
Doctors use carboplatin for lung cancer, ovarian cancer, testicular cancer, head cancer, brain tumors, bladder cancer, and retinoblastoma. The pharmacologic category is antineoplastic agent or alkylating agent. The first alkylating agents were synthesized in 1854, but the dramatic effect on human tissue was not known until sulfur mustard was used as a weapon during World War I. Physicians caring for victims of this gruesome chemical weapon identified some of its widespread systemic effects. Between the two World Wars extensive research was undertaken by Gilman and colleagues on nitrogen mustard and similar compounds, specifically the ability of the alkylating agents to kill cancerous cells. In the early 1960s mechlorethamine ushered in the modern age of chemotherapeutic cancer treatment as the first nitrogen mustard was introduced as an antineoplastic agent. In contrast to other cancer chemotherapeutic drugs, alkylating agents are distinguished by their ability to bind with DNA and disrupt cellular functions at all stages of the cell cycle. Alkylating compounds are sometimes referred to as mono- or bifunctional depending on the number on covalent bonds they can form within the DNA. Bifunctional agents lead to cross-linking of DNA which leads to more efficient cell death. Monofunctional agents cause single nucleotide disruption are more prone to mutagenesis and carcinogenesis—presumably because the drug forms a stable change in the DNA and is passed to subsequent generations of cells.